The testimonials that follow were received via email and posted exactly as received regarding heavy duty dog crates by Xtreme® Dog Crates. In respect to customer privacy, we show only the owner's first name and state. Occasionally we will show the dog's name as well. We post the good and the bad. FYI, we've not received any bad reviews. Xtreme® Dog Crates are made of the strongest steel products. They will last for many years. The reviews relate primarily to our heavy duty dog crates for Separation Anxiety dogs. The crate pictured above is one of our Giant Crates. In the first week alone she had soiled the house, chewed through crates, doors, and doorknobs resulting in severely hurting herself while escaping the house and running free for hours! I started researching crates and came across CarryMyDog, and while extremely leery of the promise of escape-proof crates, I ordered a Medium Max for my 60 lb pit. The crate was extremely easy to put together and I have to say - I had no reason to be apprehensive! This crate is the real deal - she has tried to dig her way out, tried to chew through the bars, tried to body slam the front - she has tried every possible way to escape and yet every evening when I get home from work, she's still in it! This crate is a life saver for dogs with separation anxiety. I've been telling anyone that will listen about it and am so glad that my pup can be home safe while I work to give her the luxurious life that she deserves. Thank you for making this fantastically constructed crate! We got our crate. It was in great condition and looks awesome. Our dog went in it easily. You can't tell but he was waging his tail. Nicely made love it. Thanks for all your help appreciate it very much. I will definitely recommend you to people. Our family adopted her a couple of months ago. She's already eaten her way out of 3 other crates. The night before last we came home to the brand new carpet in the living room demolished. The kennel worked out great, My son got home from work and his dog was knocked out, asleep. She wore herself out. It worked out wonderful. I want to thank you guys so much for helping us out. We are very appreciative. Thank you a thousand times. Take care and nice doing business with you. Sarge has been doing very well in his new "Castle". He always goes right in without a fuss and, as far as I can tell, he doesn't even bother trying to get out. I think he understands that he has no chance and the construction doesn't allow him anywhere to grab a hold of. I can't tell you the peace of mind of being able to come home and know that I won't have to add to my list of 4 windows, a door, a whole wall, 200+ feet of fencing, my brand new 55" 4K TV, and more, of destroyed items. With the easy to remove door, he even goes in there on his own when we are just hanging out. I think because of the size and construct, it feels more like a real secure room for him than a prison. Anyway, I can't thank you guys enough for giving me my life back and the quick shipment. 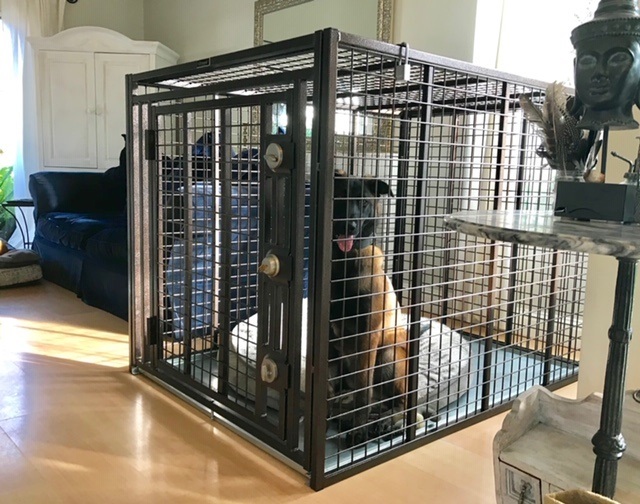 Between the security and the ridiculous ease of the put up and tear down, I simple couldn't recommend any other cage for people with anxious or problematic dog companions in their lives. Well worth the price. I have included a few pictures and, aside from needing a better shaped bed, you can see Sarge sitting pretty in his castle. The size really gives him a lot of room to move around in and I feel far less bad about putting him in there than I did the smaller crates. Our wonderful Riley, once had a best friend German Shepherd, Levi, who passed away from complications of the flooding during Hurricane Harvey. Riley has always had severe separation anxiety to the point that he has chewed holes in drywall, door trim, escaped every kennel we purchased previously, and broken out of all fenced enclosures. And believe me, there are many more stories. As a rescue German Shepherd, he was returned to the rescue group by 2 families prior to us adopting him. We were able to acclimate him to our home with Levi, who became his best friend and his therapy. They were a bonded pair immediately. We have all mourned the loss of Levi, and in the midst of all the loss from the flood, we had to move across the country to find work. The crate does not have any sharp edges or any way that Riley can escape. The kennel is the safest place for him to be if he is not with his human friends. He actually is very comfortable in the crate and will willingly go in the crate on command (with a small treat of course). We know for a fact he is very calm in the kennel because we have monitored him with video cameras. (this is Bill from CarryMyDog.com, and I need to tell everyone that the crate shown here is not being offered except as a custom crate. This crate was a one-of-a-kind made especially for Riley. We will be offering this crate very soon. If you need a 48" heavy duty crate that will fit in a Toyota (i.e.) trunk, then give us a call. When he escapes his crate, he DESTROYS the house. He scratches, panics, screams, goes to the bathroom everywhere, and anything else you can think of - he's done that too! I found Xtreme dog crates. They were such a blessing! The owners are very kind and worked with me on time. They realized my desperation and met with me after hours at the factory. They taught me how to assemble the cage. I have to say that it is beyond simple! He is safe and cannot harm himself, the house, or the Xtreme dog cage. I have had my new cage for a little over 6 months now, and it still looks as new and undamaged as day 1! I WILL NEVER HAVE TO BUY ANOTHER CAGE AGAIN! I know these cages were a bit pricey for me but, they are worth every penny! I have the sweetest dog in the world. It just so happens that the moment I have to step out and put him in a crate, he's a wild beast that doesn't want to be caged. He has severe separation anxiety and gets pretty destructive when left alone. I originally purchased an Impact dog crate in hopes that it would hold him for a few hours while I was at work or just not home, but he was able to pull the bars off of the door one by one until he got them all off and was just able to walk right through the door. These are not cheap dog crates here... I got no help from Impact Crate's manufacturer at all, but Bill Beavers was understanding and helped me by sending me an Xtreme Heavy Duty dog crate. Admittedly I was a bit intimidated when I came home and saw this HUGE crate boxed and fully assembled in my driveway, but taking it apart and putting together is literally a breeze. It took about 5 minutes to take it apart the first time and pretty much the same putting it back together. As soon as I gave it a good shake and tug I knew this was it, and as long as I'm home he'll go and chill out in it. This thing is great for my dog when I NEED to put him in it. I've had zero issues and don't expect to. I Love the cage and will be bringing it with us to NY when we visit family. It was a great investment and I’m so glad I did this!! I would like to share with you how happy we are with our new dog crate. This crate is awesome and you have made my family raving fans of this product. We were at our wits end with our dog, which had destroyed two crates, one of which was heavily reinforced. This crate is truly amazing, the finish and craftsmanship is outstanding. After a visit every weekend for a month or so he finally showed up on the website as adoptable. The next day we headed over and finally got to spend some time with this gentle giant and learn a bit about his background. The shelter had rescued a number of mastiffs from a South Korean meat farm that was being turned into a blueberry farm and Leon was one of the lucky ones to be brought over. Well we just fell in love with him right away and our two other pups took to him as well, so we brought him home that day. Things are always hectic with a new dog, especially one who has never had a chance to be a puppy. Potty training kicked in easily, playing with others was going great and he was starting to finally gain the weight he needed. Just one thing wasn't working. He kept escaping and breaking the crates. He went through 2 metal crates from the pet store and then finally the plastic one the shelter gave us that he was shipped over in. The only thing that worked was leaving him in the space the other two were left in, which was the kitchen/dinning room. It looked promising......for a couple days. At first it was a few cookbook destroyed. Then somehow the coffee pot was taken down from the counter. Finally nothing stood a chance if left out, not even the new reclining reading chair. Every time we came home it was not a question of if, but what was destroyed. It was time to do some research. Finally one day I came across Carry My Dog's website and searched through their products. I felt as if I had finally found a crate made by a dog owner who knew the kind of issues I have had to deal with. We ordered the Heavy Duty dog crate with two deadbolts and wire that is welded together at every crossing. Our only issues was delivery time. We needed it ASAP. I emailed them about our issues and got a response right away. Bill Beavers worked with us to get our crate to us as soon as it was possible and we couldn't be happier in our home. When we leave the house with Leon in his crate we know not only is our house safe from him, but that he is safe and happy. She is huge and yes, if left alone in the house she has chewed on the furniture at my daughter's place. The cage is a huge blessing for our furniture and keeps her from hurting herself too. I have a husky (half the size of Zoey) too and they have become best friends. First, we got pet insurance, and then we ordered our crate from you. It has been easy to get her in the crate because she truly believes she’ll be able to get out. She can’t! So far, so good. We are cautiously optimistic that this crate is going to work out. Our friends are taking bets. She hasn’t calmed down in the crate yet, but she is a very determined dog, soFrankie from New York in her new heavy duty dog crate from carrymydog.com I am hoping/thinking it’s just a matter of time. I would love to tell you that this dog loves the crate and everything is wonderful. She doesn’t like it, but it’s doing what it’s supposed to do, so far! That makes us happy because Frankie is safe. We were desperate to get our crate as soon as possible. Without it, we were basicallyOzzy Close-up enjoying his new Heavy Duty Dog crate from CarryMyDog.com being held hostage at home by the dog because we couldn’t leave him alone. Bill at CarryMyDog.com, was great. He answered all of my questions and made sure the crate was shipped to us as soon as possible. Now, Winston is rescued Bullmastiff x Amstaff, about 90 lbs, literally all muscle, and has fairly bad separation anxiety. He can bend and break bars, crack welds Xtreme heavy duty dog crate & Winstonand pull off plates on other wire crates. Plastic doesnt stand a chance, he'll chew through in short order He has shredded 24 gauge aluminum plate, and bent 20 guage steel plate that i have used to reinforce other crates. He will escape, and chew off doorknobs and molding in an attempt to get out to find me, and has done alot of damage to his teeth in the process. You will find our standard sized drop-pin heavy duty dog crates here. You will find our Giant heavy duty crates with drop-pin design here. You will find our all welded one-piece lower priced Econocrate here. You will find our commercial grade outdoor dog kennels and dog runs here. All are guaranteed escape-proof and indestructible. Order yours today!